My bestie all the way through school was Louise Matthews whose family owned the local ice-cream company; and who says I don’t know how to choose my friends well. Louise and I accompanied each other to Girl Guides, Youth Clubs, Barn Dances and eventually our first forays into the seedy world of nightclubs; when we wore far too much cheap make-up and ridiculously high heels. Both of us also used to sneak our real clubbing outfits, which were deemed unsuitable by our mothers, into our excessively large bags and change in the nightclub toilets once we escaped from our overly protective parents. One evening Louise’s Dad offered us a lift into town and as students any cost saving exercise which would result in us being able to purchase an additional Bacardi Breezer or the more sophisticated half a pint of Snakebite was a welcome bonus. However, both of us were a little disappointed when we discovered that he intended to drive us into town in the back of one of his ice-cream vans but as we knew the journey would be a short one, we reckoned that no-one would see us and thus our street-cred would remain intact. With trepidation we hiked up our short skirts and teetered gingerly into the back of the van in a cloud of overpowering perfume; I think it may have been called something along the lines of Tramp or Harlot and smelled more like toxic waste than designer fragrance but we thought it was the teenage equivalent of catnip. As he drove through a particularly large housing estate, we were mortified when he switched on the chimes which played “Popeye the Sailor Man”. Unsurprisingly, this drew a rather large crowd so Louise’s Dad not wanting to miss a sales opportunity, pulled the van up and asked us to serve his customers. 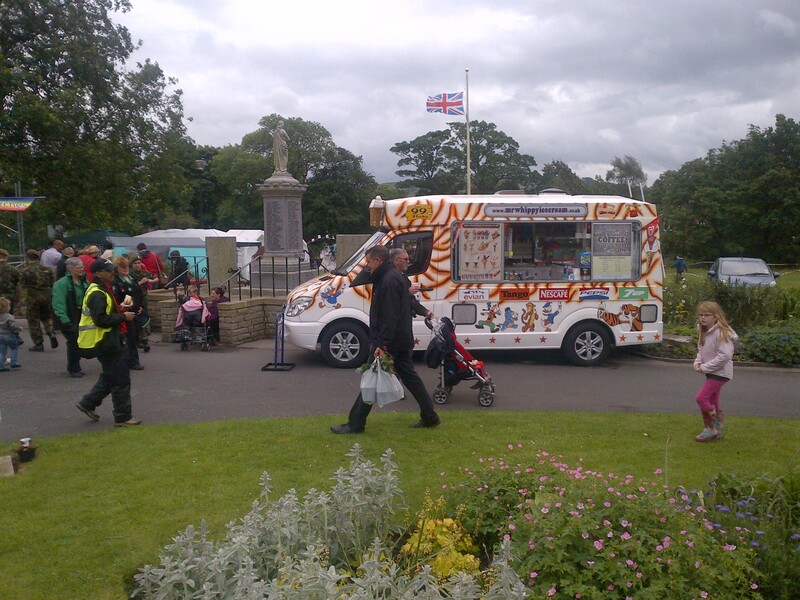 To be fair he did suggest that we don the non-too attractive nylon overalls hanging on the van’s rear door and we reluctantly set about serving our waiting public 99’s (that’s a cornet with a chocolate flake – I know my ice-cream). We made several other stops that evening but both Louise and I drew the line at serving the crowd outside the nightclub; we wanted to hold onto what little dignity we had left. Do you think he knew what you were up to that night and decided to “help” you. Great story. I so have an image of this event haha. Cool song too! Anything with Tammy Wynette in it singing about ice-cream vans rocks my world – any more news on your exciting move? Love a 99! 🙂 haven’t had one in years. The fact that you know what a 99 is, just demonstrates that you are as big an ice-cream fan as me! Suzanne you don’t know what you missed, I even got to take a midnight mint choc ice with me – how spooky our nightclub was called Busbys too! I regularly get “Justified and Ancient” stuck in my head. At least once a month. Then I do a little dancing and that clears it out. 🙂 Heading back to Turkey next month. I’ll be thinking of you! I haven’t been able to stop humming it and dancing to it ever since I got the idea for the post and you’re right I’m (to quote my teenage nieces) well jel. I don’t suppose I need to tell you to have a great time! Is that with a flake? Obviously the ice-cream vendor is just doing a drive by as he loves looking at your garden, Kaye! Overalls, ice cream and Tammy, that makes life about perfect. Great post! I was kept in raspberry ripple and mint choc chips all through my school days! I swear, you can make a great story out of just about anything! I lived for the ice cream van coming around, but I’ve never ridden in one. You’re one up on me. 😀 Great story, Dallas. How extraordinary – we’re playing Justified and Ancient a lot at the moment (has to be the Tammy version!) as we’re thinking of it for the intro piece for our marriage ceremony in France – we call it Rustified and Ancient. Great story, I can imagine the embarrassment as you got closer to town and the anxiety of wanting to get off the van and head to the club. That is the best story ever! I can just imagine a couple of street-cred aware teens cowering to the tune of Popeye the sailor man!!! Love your choice of music …. just have to download. Never heard before. Great dance tune. I would say that ice cream is happiness that we can buy …. *smile Personal I’m addicted to Magnum of any kind. You have been … out in the most strange kinds of transportation. In the summer I have a Magnum per day .. when I’m out and about!!! My mom loved them too .. and she always had the mini versions in her freezer. I couldn’t find the tune with Tammy on Itune .. so I had one foot outside the law .. but I have it downloaded now. I didn’t know there a song at all. Just love the song. Thanks a million. This reminds me of the time I had to help my dad choose some lingerie for my mom for Valentine’s Day at Victoria’s Secret. And while we were there, I saw some girls from high school, as the employee is asking us what is my mom’s cup size. I wanted to die. I still don’t know how I got roped into choosing lingerie for my own mother! This Dallas, this is hysterical. I think he must have done this on purpose, street creds indeed. Ice cream AND a night club? Girl, you know how to party! Can I please join in on the fun?! Perfect night out for us both; I wonder if they do Skinny Pirate ice-creams! This is a hilarious story. What a great memory! I’m sure you both were mortified but it makes for a good laugh. Did he pick you up at the end of the night w/ a scoop of vanilla waiting?